Walking out of the cinema on a Friday night, half a box of popcorn in hand and cell phone in the other, my mind begins to scrutinise the contents of the film I’ve just watched. I try to decipher the film’s alignment in presenting either fact or fiction, using my understanding of the concept the ‘American movie’. Would two middle-aged men truly be considered valid applications for a graduate opportunity? Were those the real offices of Google or did the crew use a design set? Is there truly such a thing as a free lunch? And most importantly, what is a Nap Pod and where can I buy one? Of course, my questions were triggered after having seen the film The Internship. My interest had been piqued; Google offices was the place to be, and I wanted an in. But what chance did I really have? A mere student with nothing, but a South African passport and a dream. That was until I had a conversation with a friend who had visited the offices of a start-up company in Cape Town called GetSmarter – she called it a mini-Google with a lively office environment and energetic staff. I soon discovered GetSmarter had way more to offer than its impressive work space. With my background in journalism and education, as well as a passion for learning, GetSmarter presented an opportunity for me to create a career in a space that combined everything that excited me. But I found I no longer cared if their offices were made up of four white walls or whether the staircase could be transformed into a giant slide or not – I had finally found a company that shared the same personality as me. I began fervently applying for every position listed on the careers page. Whether it was in the field of system development, human resources or video editing; I was applying for it. Every single job offer sounded so exciting. Hopefully whoever they had writing up those job descriptions received a promotion because they were reeling me in word by word. Although my job experience was lacking and I had nothing close to the qualifications needed for some of the positions, I couldn’t stop myself from pressing that bright pink ‘send application’ button. I wanted to learn how to do anything and everything at GetSmarter because I believed any job there would lead to the end product of improving people’s lives through online education. That kept me going. I soon discovered I may have been a bit too eager when applying for positions I was completely unsuited for. I went from one interview to the next, often having to explain why I had gone application crazy and how I actually did not have much experience in anything but journalism and teaching. Instead, after a few too many failed applications, I made the decision to put the dream on hold, and accept a position at a magazine. That was close to two years ago and today I can say with pride and utter excitement – I made it! It may be only day three and I’m in both the ironic position of intern and newbie, but GetSmarter has finally opened its pink and furry arms to welcome me into its 300-strong team – furry being characteristic of the company mascot (which looks like something out of Monster’s Inc). The playful decor, personal gym, health food and smoothie bar, social courtyard, games area, and the company’s own music Gleek Club, are some amazing benefits, but what I learned very quickly after having fallen in love with GetSmarter so long ago is that the unique and relational culture is what makes this organisation so special and consequently, successful. 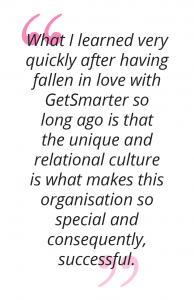 Starting out with just a few staff members to 400+ employees today, GetSmarter has never allowed growth in numbers to interfere with the importance of relationships. From the moment I nervously walked in, I was made to feel like I had a purpose in this company – regardless of experience, age, department or hierarchy. Visitors will often describe how the energy within the offices welcomes them as they walk through the door and the overarching goal towards embracing lifelong learning is evident in everything that’s done. GetSmarter’s big, hairy, audacious goal is to change one million lives by 2030, and they’re well on their way. At the centre of it all, this company wants to use education as a weapon to change the world and if we happen to do that by having a bit of fun along the way, that suits me just fine. Are you interested in joining the GetSmarter team? We are always on the look-out for new talent.